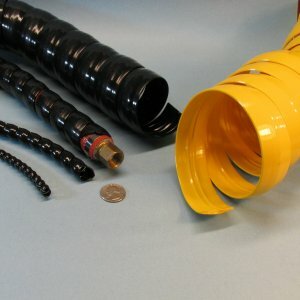 This abrasion protection spiral wrap is manufactured from highly impact resistant plasticized cellulose acetate (black or yellow) and is simply wrapped over hydraulic hose, wires or cable to provide tough protection for abrasion and wear protection. This abrasion protection wrap is commonly used on mobile equipment and robots, front end loaders, mining equipment, trucks, railcars, buses. Both versions are MSHAIC-207/5 approved.